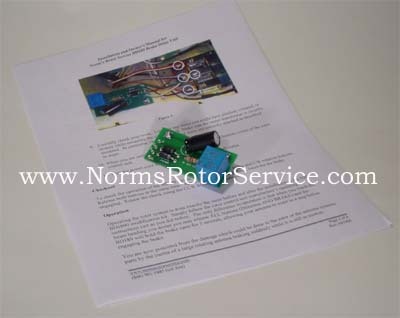 Norm's Rotor Service has manufactured and distributed the BD-189 brake delay unit since 1989. The BD-189 is a simple but extremely high-quality time delay unit designed for the protection of rotor systems with a solenoid brake. Many operators have learned the hard way the consequences of accidentally applying the brake in these antenna rotors before the rotor and antenna have come to a complete stop. Gears, brake wedges, rotor castings, and other components can all be damaged or destroyed by premature application of the rotor brake. The NRS BD-189 delays the application of the rotor brake for five seconds after the rotor motor is de-energized. This five second delay provides a safety factor to allow all the parts of the antenna and rotor system to come to rest before the brake is applied. Installation of the NRS BD-189 modification kit is simple and straightforward and does not affect the operation of the rotor or the rotor control unit in any way, except for the brake delay. The circuit board mounts right in the rotor control box, under the chassis, using existing holes. Complete instructions with color photographs detail the installation which requires no special tools, and can be accomplished in about 10 minutes with only a screwdriver, a pair of pliers, a soldering iron, and solder. No modifications whatever are made to the existing circuitry during installation. De-installation therefore requires only that four wires be unsoldered and the NRS BD-189 circuit board be physically removed. The unit can, therefore, be easily moved to a new rotor control unit in the event the operator changes to a new or upgraded control box. The BD-189 brake delay unit is priced at $35.00.